“Cities of the Future” is the title of the new radio show Frekvenca X, which was broadcast on the Slovenian national radio channel Val 202 in October and November. Anthropologist Dr Dan Podjed was a guest expert commentator in the series, while in the second episode, dedicated to smart buildings and neighbourhoods, journalists Jan Grilc and Luka Hvalc also talked to IRI UL researcher, Jure Vetršek, MSc. Vetršek explained to the journalists how a smart building, housing the Faculty of Computer and Information Science and the Faculty of Chemistry and Chemical Technology of the University of Ljubljana, works. “There are over 20,000 signals on the control system,” Vetršek explained, adding that this is not a classic control system, used in residential buildings. The building is controlled by a large and complex control panel. “There are approximately five hundred rooms in the building, in which the temperature is measured, as well as occupancy, or the opening windows. 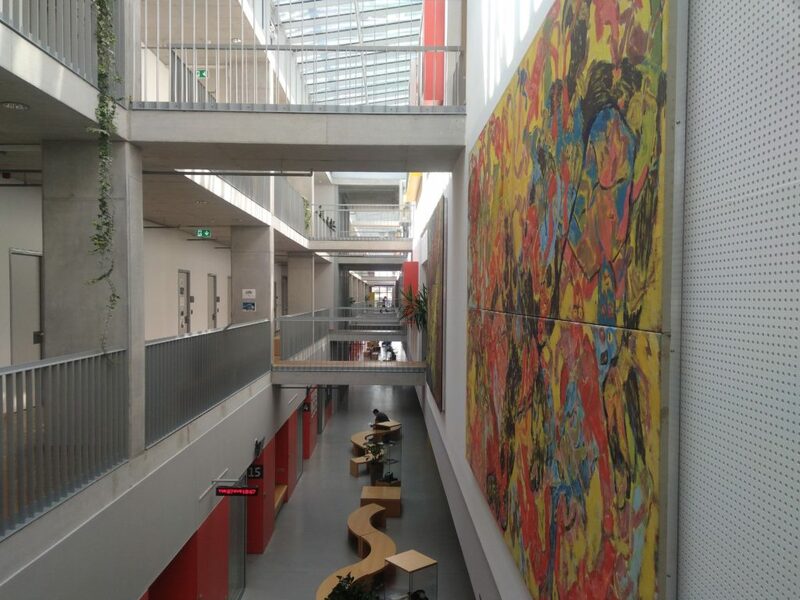 The building has smart lighting, ventilation … Everything is harmonised with the schedules of pedagogical activities,” Vetršek pointed out the key advantages of the building, which is also part of IRI UL’s research in two international projects, PEOPLE and MOBISTYLE. In these projects, we are researching how the building occupants feel and behave inside the building, as well as how we can influence their health and well-being through technological and non-technological interventions and solutions. In this episode, Dr Podjed pointed out some of the shortcomings of such a smart building, which, in his opinion, has an extraordinary potential which it is not fully utilized. “The main problem is that people sometimes feel excluded from the management of their indoor environment,” said Podjed, adding that people should be an integral part in the process of designing such facilities. “The ideal smart building would be so smart that you no longer needed a human being. But buildings are made for people, and we must not forget that,” he underlined. Other interesting urban solutions were presented in the episode, such as the “vertical forest” on a Milan skyscraper and the »superislands« for reducing traffic in Barcelona. They also tackled the problems that occur in urban centres due to mass tourism. A drastic example of such a “touristification” that completely destroyed the autochthonous way of life is Venice; Slovenian tourist centres, for example Bled, Ljubljana, and Piran, are dealing with similar challenges, such as higher prices of real estate and traffic difficulties. At the end of the show, Dr Podjed underlined that people must be at the centre of positive change in cities. “If we achieve changes in the minds, change will also happen in traffic, in buildings, in neighbourhoods. People need to think greener, more sustainable, think about their future and feel that they can contribute to shaping and transforming their cities.” Such shifts in the head are also an integral part of IRI UL projects, devoted to designing technologies and solutions that have the potential to change our lifestyles and behaviour.